All transactions are safe and secure with a reliable history in online purchasing behind each of our associates. Buy the That's Frank t-shirt to own Donnie Darko clothing and merchandise. 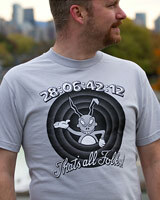 This creative design combines the Donnie Darko movie with the classic Looney Toons ending. After all, Frank did tell us that the world would end in 28 days, 6 hours, 42 minutes and 12 seconds. Here, Frank is telling us, "That's all Folks!" to let us know that the world will soon come to an end. Wear this shirt to remind everyone that the day of reckoning is quickly approaching. In addition to the That's Frank tee above, browse the Donnie Darko Clothing Gallery for more apparel like men's and women's clothes, kids shirts or hoodies.